A little info on the pre-processing: I have downloaded Bam files from the TCGA, used Samtools to sort the Bam files, used Picard tools to mark duplicates, samtools to build the mpileup and now running varscan2 for the copy number output. Anyone have any idea on what could be causing the Parsing Exception error and how I might possibly circumvent this? I've done a little googling and saw that in other cases people have tried removing 0 coverage lines by piping the mpileup through the awk command, but I thought this issue was addressed in the later versions of Varscan. Thank you kindly for reading! How does that line look different from the others? For example use the following on your file grep -w -A 5 -B 5 '12956' yourfile.txt with -w (only searching for whole occurences of the string, 129568 is not a match), with -A (printing n lines after the match), with -B (printing n lines before the match). That image is apparently a good way of sharing your result ;) Another step to assist in troubleshooting would be to remove the offending line using grep -w -v 12956 yourfile.txt > outfile.tsv with -v (for inverse, keep everything that doesn't match). Off course that's not desired to remove positions, but it might help to nail down the problem. If's its a larger problem you'll see plenty of other positions with errors, if it's just this... then it's a weird position worth investigating. I'm not familiar with Varscan so I looked for a manual and found this: http://dkoboldt.github.io/varscan/copy-number-calling.html I can't find where it specifies you should use -B in the mpileup command. Maybe you are following another resource? Thank you very much for your input, I'll definitely try it out! "Hello, and thanks for posting this issue. Yes, VarScan does not expect to see a line with coverage=0 in a single-sample pileup file. VarScan v2.3.6 addresses this issue and should not crash. 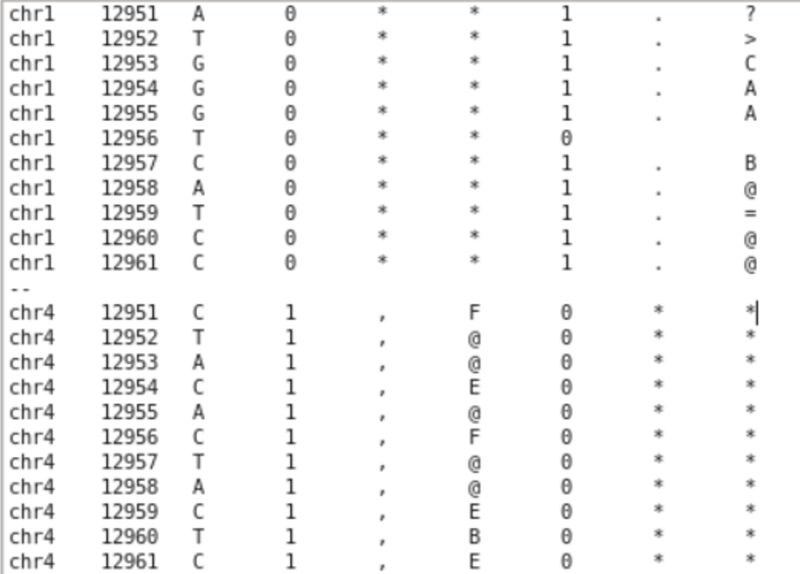 In either case, I recommend using two-sample mpileups for normal/tumor comparisons (somatic and copynumber), but doing so with the -B parameter (in samtools mpileup) to disable BAQ computation." So I've tried just about everything and no success and I'm about to give up on ever graduating. and that has still resulted in a "Parsing Exception Error". I've posted this problem on the Varscan help forums but got no support. I even E-mailed Dan Koboldt, creator of the Varscan program, to no avail. My apologies if I seem to have lost my patience here, but it's a problem I've been struggling with since April to no avail and it's the one thing that's keeping me from graduating. Would removing "chrMT" and "chrUnknown" from my bam files help solve this issue? If so, is there a proper way to remove those from my bam files? Would I also have to remove them from my reference fasta? I'm having the same issue with VarScan and I'm wondering if there's any option not to deactivate the BAQ option (-B) in mpileup (to calculate base alignment quality) and pipe it to VarScan somatic... if not, how much information about alignment is lost and it'd be relevant?